So, you think you know the age of the earth? It's pretty well established. Kind of like the value of pi. It doesn't have an exact numerical figure yet, but it's being worked on all the time. According to my research is it 4.992 billion 548 million, 521 thousand, 812 days, 4 hours and 5, no 6, no 7 seconds. That's amazing precision. Can you cite the models you used to come up with such an exacting number? People do not have kids to have them indoctrinated by the government, people. If parents want to teach THEIR kids that God created the universe, that is their right as parents of THEIR kids. God forbid the government teach kids anything, the way it's run. Believing that parents don't have a right to teach their kids their belief system is a dangerous thought process and no different that the left screaming that conservatives are trying to tell them how to think and live. Why do you think so many parents are homeschooling in this country? Because the government, by way of the public government schools, is trying to usurp their rights as parents. BTW, for all of you folks who are so sure of a scientific theory that has never been proven, can I just ask, if humans evolved from apes, then why are there still apes on this planet? Why did only some of the apes "evolve"? No one ever seems to be able to answer that, along with a whole lot of other questions that pop up when one tries to prove evolution. Evolution: just another tired excuse to try to disprove there is a Creator so that there is no absolute standard of right and wrong. Thank you for proving why Creationism should not be taught in schools. You realize you just asked quite possibly the dumbest question in the Creationist playbook right? It's so patently stupid, right wing creationists organizations like Answers in Genesis tell you specifically to not to ask such stupid questions. Humans did not evolve from apes. Humans are one of the Great Apes. We share a common ancestor with other ape species. Your argument is as dumb as asking, if Americans came from Europeans, why are there still Europeans? Btw, evolution is a proven fact. You utilize it every time your doctor prescribes you medicine. It's been observed in person and in the lab. You also realize that Gravity is nothing more than a scientific theory right? Willing to test the accuracy of that theory by jumping off a building? I think the inerpretation of Christianity lends itself to existing side by side with evolution theories. To within a 1% margin of error, yes. 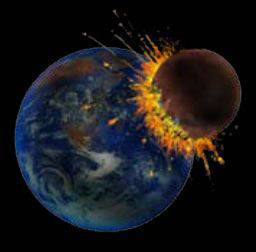 It all depends on when Theia impacted the earth to create the current earth and moon. Well, the easy answer is that we did not evolve from the current apes in existence, but a common ancestor. Meanwhile, the other offshoots of that common ancestor evolved as they are into what environmental niches that allowed them to propagate and continue existence. Obviously some apes are much more adept in certain environments than humans are, but we evolved much more important faculties which have allowed us to dominate a lot of the globe. Also, evolution does not have to exclusively tied to disproving a creator. There are different interpretations of faith out there, including the Christian faith. One's understanding of God is not necessarily the same as everyone else's even if you are all avowed to what is essentially the same Christian God. I'm happy to leave that be, because I believe faith often drives us to greater things than what we have in front of us in our meagre existence. However, I think that if there is a rational and testable pragmatic avenue for knowledge and understanding of what exists, we should pursue it for both economic benefit and for understanding what is at the core of existence. This should be irrespective of what faith there is, because it is of benefit to all. Dear creationists: Read the book "The Greatest Show On Earth" by Richard Dawkins. It's a little above your comprehension levels so make sure you have a dictionary on hand. Also, it's written by an atheist, but I promise you won't go to hell just for reading it. Maybe it'll open your eyes to the evidence for evolution, and also open you to the idea that you can accept the fact of evolution and still be religious. Firstly, you can teach your kids whatever floats your boat, I ain't stopping you. Secondly, evolution is an important concept that has major scientific importance, so it would be downright silly not to teach it, whether you "believe" in it or not. You are free to dispute anything, if you so chose. But science is a class, and religious beliefs and myths is not, not in public school, anyway. Thirdly, you really need to read a book, because the answer to your question is that we did not evolve from apes. If you had any basic understanding of evolution at all you would know this. That's why "the government" needs to teach it in school - although it obviously went somewhat over your head, so there aren't any guarantees that people will actually take it in. Fourthly, evolution does not prove or disprove the existence of a creator. So there's no need to demonize it on that account. Lastly, it's awful that so many people still think this way. Scary. Especially those with the ability to create policy. Gawd help us.